In my last article, we discussed about the concept of SignalR and how we can use it to create a simple web based group chat. It included a good deal of explanation of how SignalR works and why it is a good candidate to create a real time application. We will not get into details again and before you start with it, I would recommend you to read my previous article here. Our this discussion will be another practical implementation of what we had learnt in the last article. Let's create another sample application to understand the use of SignalR. This application will be an html page, which displays some data from the database. At the back-end of this sample, we will have another application, say any form, windows service or RSS feed, which will insert the new data into the database. As soon as the new data is added to the database, that will be reflected on this html page. An important point before we start the discussion is that this example will not only use the SignalR, but also the concept of SqlDependency, so that our server hub get's notified about any change in the database and broadcast the latest data to the users. To describe the logic briefly, our hub will subscribe to SqlServer for any change in its data in the database, get notified, fetch the latest data and broadcast it to the html page. So our application will consist of following 3 separate components. § Sample table called Users in a Sql database, with its ServiceBroker enabled. 1. 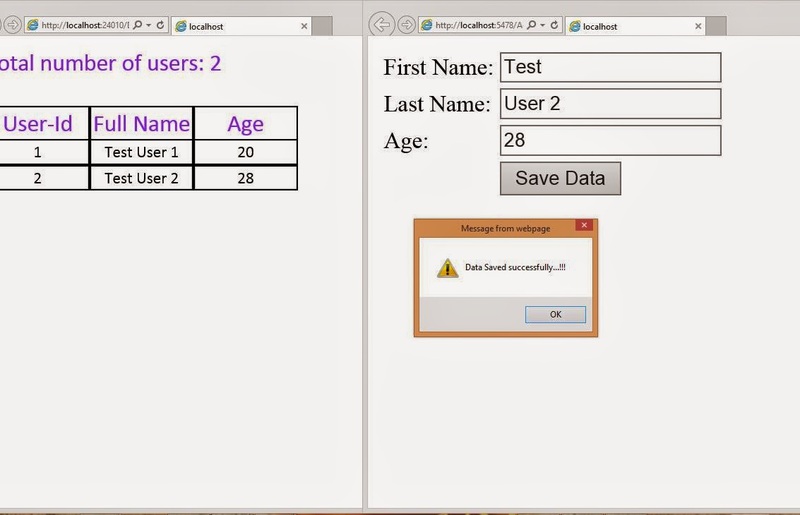 A webapi which receive data from a third application and save it into the database. 2. A SignalR component to broadcast the latest data to the users. § An application with an html page to submit new data to the database by making calls to the webapi. 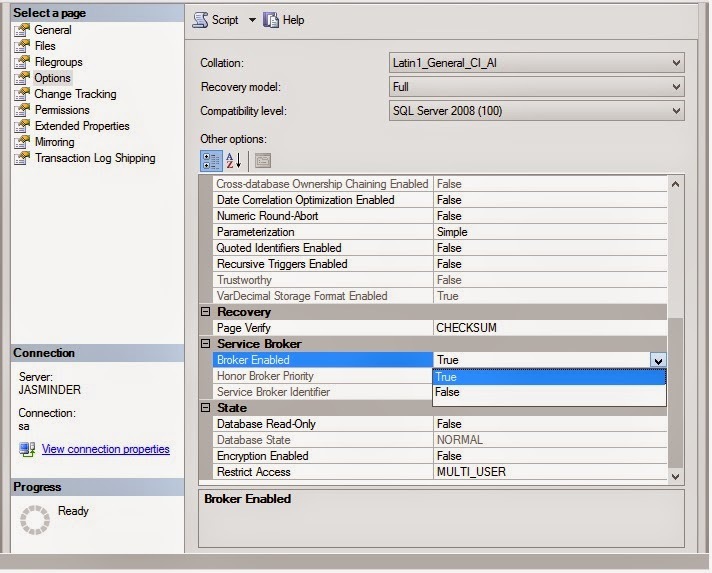 or, from the UI by selecting the database, right click on its properties, go to the Options, navigate to the Service Broker section and change the value to True for Broker Enabled property. 1. 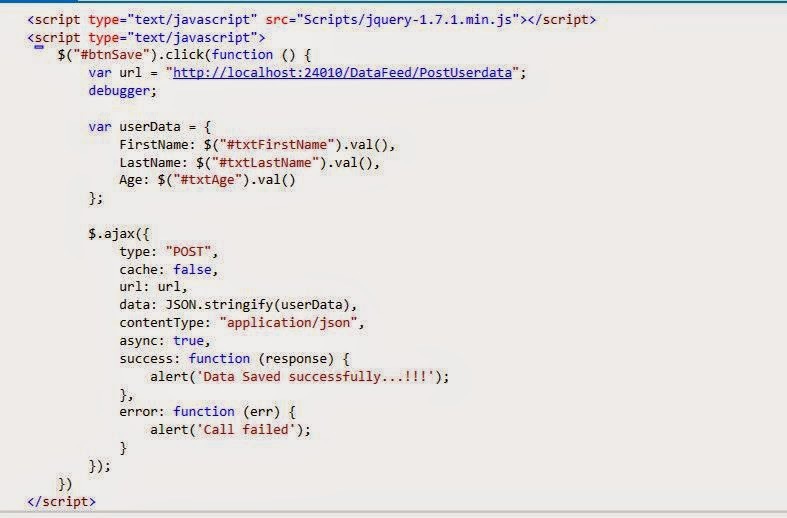 Webapi to receive the data from the data feed application and save into the database. 2. An html page to display the data from the database. 2. 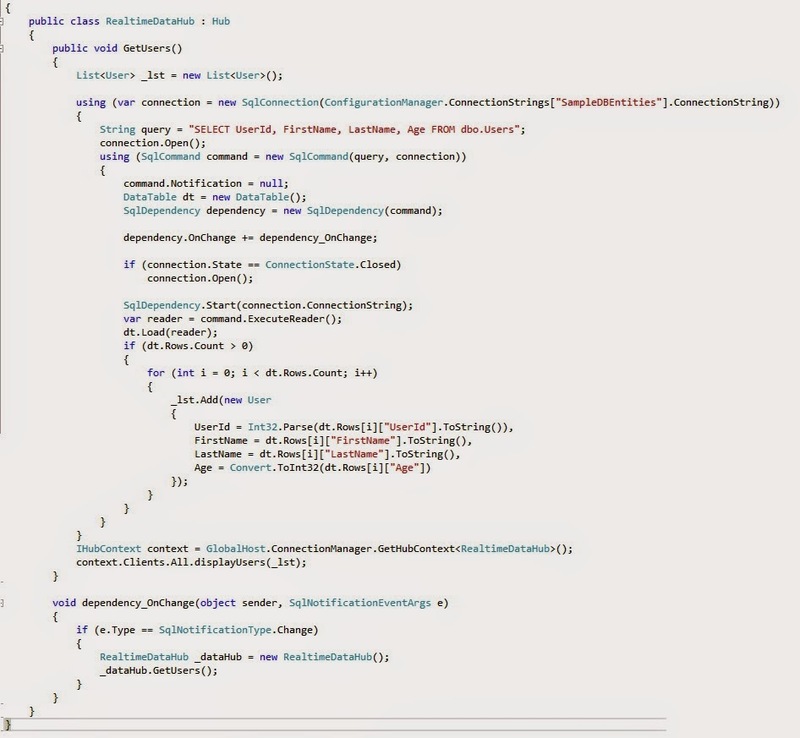 SignalR component which will refresh the html page with latest data, as soon as the new data is added to the database. Now in order to host the Webapi and SignalR, we add a file named Startup.cs and add the routing template for Webapi and register both the webapi and SignalR to the OWIN pipeline. When we start the application, it will result in hosting of the Webapi at the back-end. 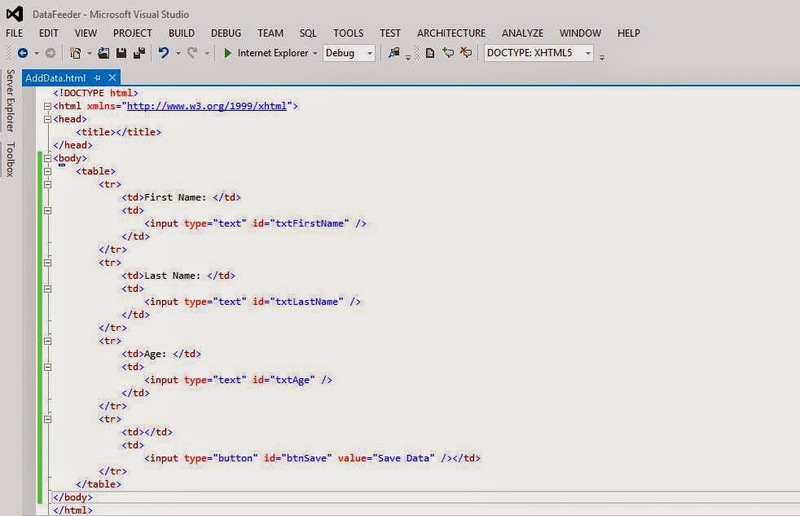 Next, use the ajax call to send the data to the webapi controller, which stores it in the database. Note that here we have used the localhost url to refer to the location where the web api is hosted. You can replace it with the actual url of the WebApi location. So now need to use timer based calls. 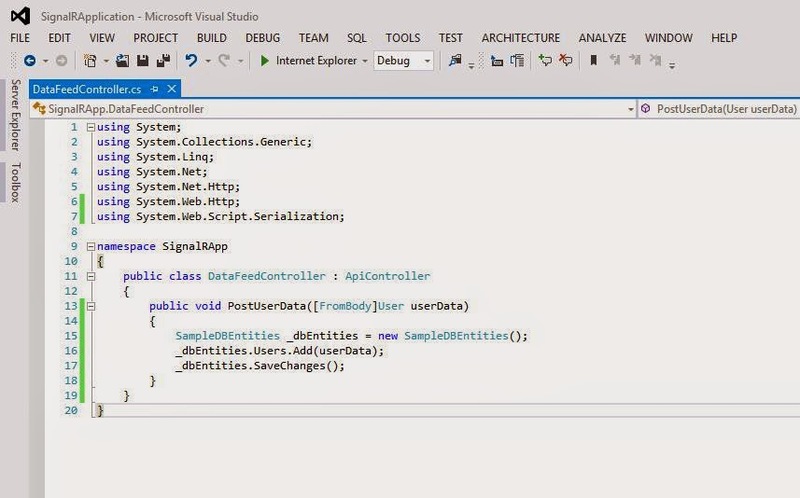 Use the SignalR functionality and create real time applications. Hope you enjoyed reading it. Happy coding...!!! Sir, Can you please share the source code. I am stuck at getting data with GetUsers() in HTML page. Hello Biju, you can refer the link below for the code. Hope it helps you...!! !